Why hasn't Trump used his 'sledgehammer' on trade? They were among President Trump's biggest threats. And so far he hasn't followed through. Two major trade investigations by the administration -- one into steel imports and one into aluminum -- are in limbo, two months after they were expected to be finished. Tougher trade policies were a core theme of Trump's campaign. He lambasted China and Mexico for stealing millions of jobs from the United States, and he promised to bring those jobs back with better trade deals or punishing tariffs. In the spring, Trump directed Commerce Secretary Wilbur Ross to investigate whether steel and aluminum shipped into the United States constitute threats to national security. If Ross determines that they do, it could start a trade war. The United States would probably impose tariffs, which could affect trade partners including Canada, China, the European Union and Brazil. Some or all could retaliate with tariffs on American products. By law, Ross has until January to make a decision. But he originally said that he hoped to wrap up by the end of June and that he had "no intention" of waiting until January. The Commerce Department won't give a new estimate now. An official told CNNMoney on Tuesday that the administration is "following the normal process of review." Trump may have hinted in July that tariffs aren't coming soon, if at all. He told The Wall Street Journal that the administration would address steel tariffs after "we get finished up health care and taxes and maybe even infrastructure," according to a transcript published by Politico. Congress hasn't even taken up taxes or infrastructure. --Geopolitics. China, which ranks 11th in steel exports to the United States, is a mediator between the United States and North Korea. With tensions high, China's role as middle man is key. --NAFTA talks. They've just begun. 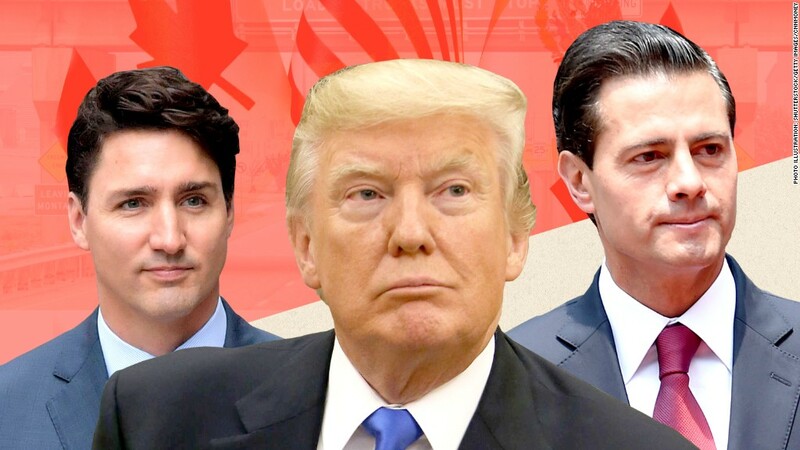 The United States is trying to renegotiate its trade deal with Canada and Mexico, and Canada is the No. 1 exporter of steel to the United States. Big tariffs on steel or aluminum could throw talks into disarray. --Everybody would be hurt by tariffs. Not just countries labeled cheaters on trade, like China, but countries and blocs that generally play by the rules, like Canada, the European Union and Brazil. --Americans would pay, too. Molson Coors Brewing Company warned in July that tariffs on aluminum, which is used to make beer cans, would make beer prices go up. An auto lobby group warned in May that steel tariffs would cost American auto jobs. "The administration figured out that there were some serious downsides to pursuing this approach," says Philip Levy, a trade expert at Northwestern University. "It's an example of how it sounds great to do protection like this, and then you realize the consequences." It may sound unusual that the trade investigation rises to a matter of national security, but the fine print explains why. Under a 1962 law, if he invokes national security, Trump can impose tariffs as high as he wants without approval from Congress. He can also get around an independent panel of U.S. trade judges. A trade official from the Clinton administration told Bloomberg in May that the law is a "big sledgehammer." Using the hammer might slug American wallets harder than the main target: China. After all, U.S. companies and consumers would have to buy more expensive steel. China has other customers. "At the end of the day, they can sell their steel elsewhere. ... It's probably going to be a bigger deal for American consumers than Chinese steel producers," says Christopher Rogers, research analyst at Panjiva, a global trade research firm. However, Trump hasn't been quiet on trade. His administration recently opened an investigation into China's alleged theft of U.S. intellectual property. It slapped tariffs on Canadian lumber. It plans to renegotiate a trade deal with South Korea. It also resolved a sugar dispute with Mexico. But all those were small moves compared with far-reaching tariffs on steel or aluminum. And, after a campaign filled with threats, Trump may be treading more lightly on trade. "He got a lot of people excited with promises of snake oil, essentially -- if you slapped tariffs on, manufacturing is going to soar," says Levy, the Northwestern professor. "As he moves away from those promises, he's likely to have some very disappointed voters."